- John Morse, Jr., in Memoir of Colonel Henry Lee, as quoted by Judson Hale. Children of the first settlers of the New Hampshire seacoast town of Hampton: Here, from the family tree, brothers from one family married sisters from another family, and a child from each of those marriages then got married and had children. As a result, the fourth great grandfather had the same great grandparents on both sides. This is interesting! Genealogy is one of our winter occupations of late. In fact, I was just on the phone to Ancestry.com the other day and learned that a sale on 6 month memberships will start later this month (the 22-26, I believe), so I may work on it all year this time. It's fun to uncover a family story, such as the one above, and to save it for table-talk when the family gets together. Such a thing happens elsewhere, too. In one old book, the county in Virginia where my father was born was described as only having emigration since well before the Civil War and no immigration. So most people were related to each other in some way. But I believe that was not so because of the class-based restrictions on marriage. In other words, you couldn't marry just anyone. My wife claims that after the war, young Southern ladies faced a shortage of suitable candidates for marriage for that reason. That was at a time when fathers had a much stronger say in who their daughters wed.
My wife's family has some "loops" in the family tree from 18th century Massachusetts. Aside from the genealogical considerations, the names are interesting. One of my grandfather's was named Asa. I have known a Hester. But Deborah doesn't sound like a 17th century name, but rather someone you knew in school in the 1950s. Do you suppose she was called "Debbie?" Deborah was a heroine and prophetess in the Old Testament Book of Judges. In Hebrew the name means "bee," so I'd guess it was associated with industriousness and wisdom. I have come across a number of Deborahs from the 17th and 18th centuries. My own grandparents, both of whom were New Englanders living in NYC, were cousins or second cousins. The first time I saw the family tree it was pretty startling because two of the lines of ancestry converged instead of branching out. My grandma and grandpa had very different childhoods -- she grew up in privilege, he in poverty -- but it seems that in the late 1930's, the world of New York City New Englanders was pretty small, so they met, fell in love and got married. It's kind of nice actually. 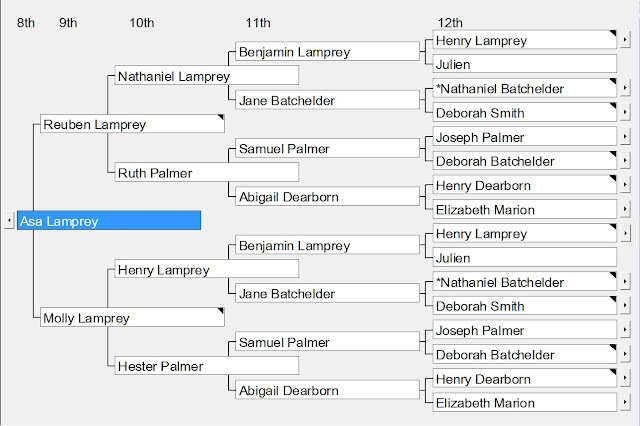 Fascinated by my family tree and how I am not related to everyone. On my mothers side her mothers ancestors where from Newington NH last name of Hoyt! My grandmother was a proud member of the DAR. We're also related to John Quincy Adams and my great great uncle served in the Union Navy during the Civil War and served on the famous USS Kearsarge that sunk the Confederate raider Alabama. It's an old world practice, alliances and such, but geneticists nowadays would have a field day.